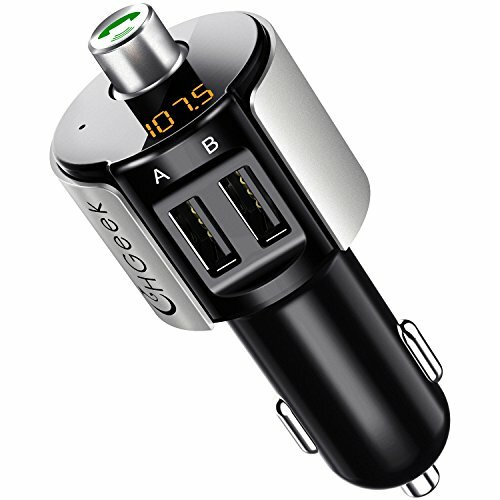 Our CHGeek CH05 Bluetooth FM Transmitter is multifunctional which can make your driving more interesting. 8.Supports pause, play next/previous songs and turn up/down the volume. 1.Plug the FM transmitter kit into your vehicle's cigarette lighter. 2.Search a BLANK band in your area by Google, choose a HIGH Channel like 106.0~108.0, then long press the button of this kit until the Channel keep flashing, and match them to the same Channel. 3.Activate your phone's Bluetooth, then search new device. When the phone detects a unit named "BT_C27A", pls press it to connect. 4.After connection, the music from your iPhone 7 plus 7 6S/Samsung Galaxy S7 S6 edge/iPod/MP3 player will be streamed out. 1.If you connect 2 USB ports together, then please charge your Tablet by "A" USB port. 2.Only the "B" USB Port can be used as a USB Reader! 3.To avoid the interference while listening to your local FM station and charging your phone, pls tune your radio to 87.5-90.0 and tune this kit to 108.0. 【Easy Operation & Broad Compatibility】: Easy one button operation for pausing, skipping song and adjusting volume / FM frequency. Wirelessly stream music from the car FM stereo system after connecting Bluetooth with your iPhone, iPad iPod, Android Samsung Galaxy, Nexus 5X 6P, Moto, MP3 MP4 Player etc. If you have any questions about this product by CHGeek, contact us by completing and submitting the form below. If you are looking for a specif part number, please include it with your message.